On February 26, 1972 promoter Ed Francis presented a 10-man tag team match plus four other matches at the Civic Auditorium. Sam Steamboat and Maddog Mayne take the fight into the crowd. Sam Steamboat clenches his fist as a stunned Maddog Mayne catches his breath. The Mighty Brutus backs Jack Carson into the corner. In earlier matches, The Mighty Brutus won over Jackie Carson. Jimmy Snuka topped Chuck Richards. 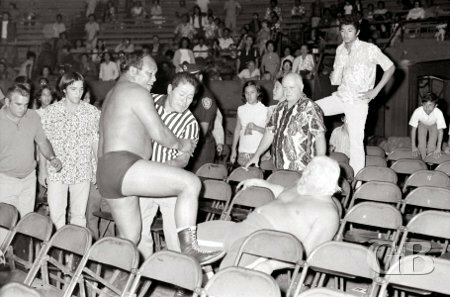 Super Star Billy Graham, making his first appearance in Honolulu, defeated Pat O'Brien. In another match Sam Steamboat and Mad Dog Mayne were both disqualified for fighting outside the ring. Super Star Billy Graham has Pat O'brien down on the mat. Graham argues with referee Wally Tsutsumi. 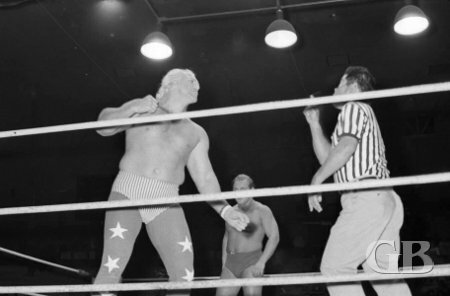 The Main event was a 10-man tag team match: Maddog Mayne an his cohorts Jack Bence, Superstar Billy Graham, The Mighty Brutus, and Chuck Richards took two out of three falls from the team of Sam Steamboat, Johnny Barend, Pat O'Brien, Jack Carson, and Jimmy Snuka. 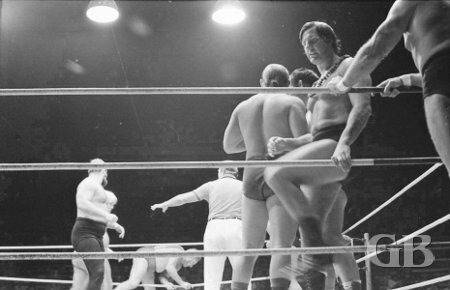 The team of Barend, Snuka, Steamboat, Carson, & O'Brien await the start of the match. 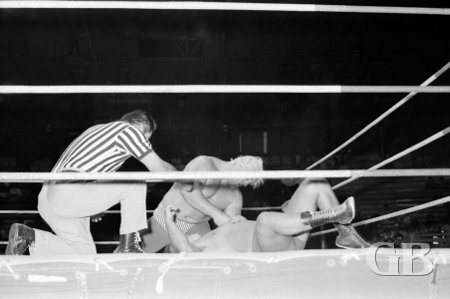 Johnny Barend's team piles it on SuperStar Billy Graham's team as Graham gets squished in the corner. 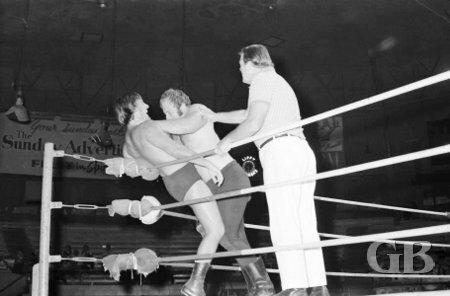 Johnny Barend about to punch Maddog Mayne in the face while Billy Graham remains tangled in the ropes.